After several days of lost dives due to bad weather, and making dives under difficult conditions, we are today in calm seas exploring an area that was discovered last year during a NOAA mapping cruise. 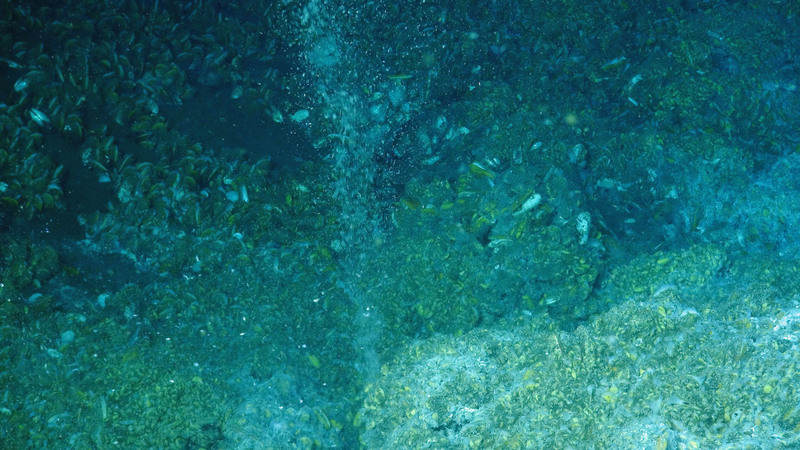 While conducting a seafloor survey, the NOAA ship Okeanos Explorer found bubbles coming from the seafloor at a site south and offshore of Norfolk Canyon; they thought these bubbles might indicate a new methane seep site, but they had no way of verifying this idea. Today we deployed the ROV JASON to 1600 m (nearly a mile deep- our deepest dive yet!) to explore the area around those bubbles. After transecting over soft sediment for a short time, we saw some indications that we were getting close to a probable methane seep; these included white patches of bacteria on the sediment surface that feed on the methane and sulfides, plus shells of dead mussels, which are the dominant animals of methane seep communities. These mussels have specialized bacteria that live in their gills and use the methane to make energy. These chemosynthetic animals (that is, those that rely on chemicals such as methane or sulfides) are unusual as they do not rely on energy from the sun, as almost every other organism does, however indirectly. They use an alternative energy source — one that may have been employed long ago in the depths where the earth’s crust split apart and released the heat and chemical fuel needed to jump start life in our oceans. 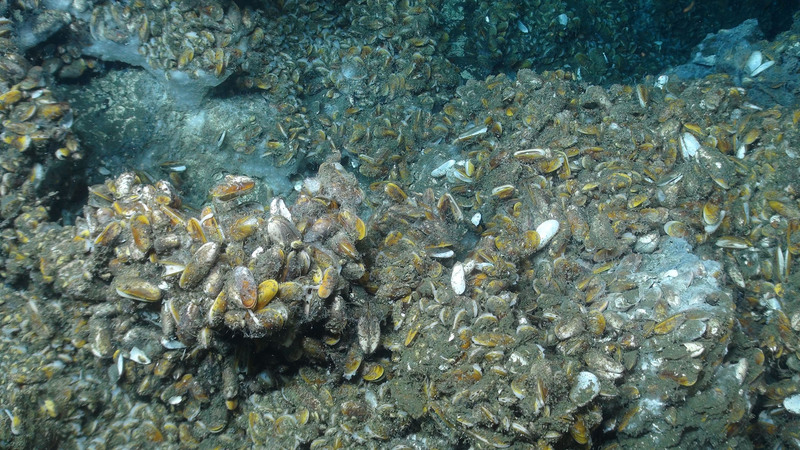 This constant energy supply allows large numbers of mussels and other animals to accumulate, thriving upon the chemicals seeping from the ocean’s floor. 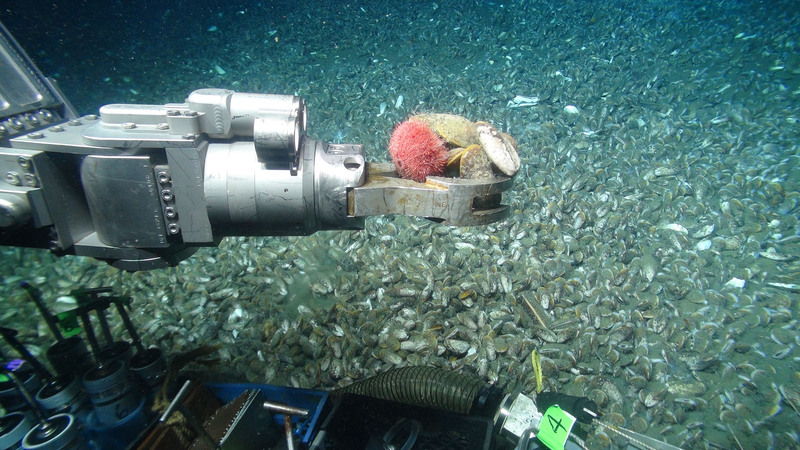 The first patch of live mussels we saw was cause for great celebration – we had confirmed the suspicions of the scientists on the Okeanus Explorer last year and found a brand new seep site, one of the very few currently known off the US Atlantic coast. 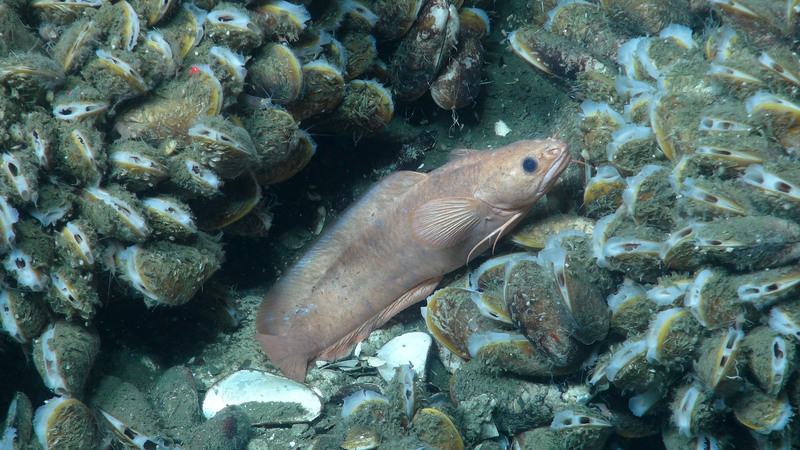 The best known seep is off South Carolina in very deep water (2500 m), and the second was re-discovered in more shallow depths (400 m) at the edge of Baltimore Canyon during our expedition last year. Although the first patch of live mussels we found was quite small, the second patch was larger, and the third mussel patch covered an area over 20 m across. This patch was packed with live mussels, plus a variety of fishes and invertebrates including soft-bodied sea cucumbers that were tangled among the mussels. Continuing on, we soon came across densely packed mussels that carpeted the bottom as far as Jason could see! The dense aggregations of mussels resembled what we often observe in rocky intertidal environments. Thick, white, bacterial mat — like a shag carpet — covered many of the mussel shells and made filaments that slowly wave back and forth. Once the jubilation of discovery was over, it was time to get to work. We took sediment cores so the USGS scientists could examine the animals living in the mud and the bacterial mat on the sediment surface. We also collected some rock samples and large dead mussel shells for ageing analysis, plus several live mussels for genetic and reproductive studies. The associated fish and invertebrates will also be used for research into food webs, to determine whether the methane is indirectly providing food for a wider community of animals living around the seep. Members of our research team have studied cold seeps in the Gulf of Mexico (Expedition to the Deep Slope 2006 and 2007), so we will be able to compare samples and observations from this site with those from the Gulf where cold seeps are more numerous and better studied. Although many comparisons between Gulf and Atlantic seeps will continue back at our labs, an obvious difference is the absence of two seep-related species that do not occur in this new Atlantic seep but are common in the Gulf: tube worms and galatheoid crabs. How are the mussels that live on methane different from the mussels that we collect on pilings and rocks along the seashore? The mussels we find at seep sites as well as the intertidal mussels one would find off the North Carolina coast are all in the family Mytilidae. Mussels at seeps are all closely related to the intertidal horsemussels ( genus Modiolus )and all fall within the genus Bathymodiolus. The obvious differences are habitat, size, and nutrition. 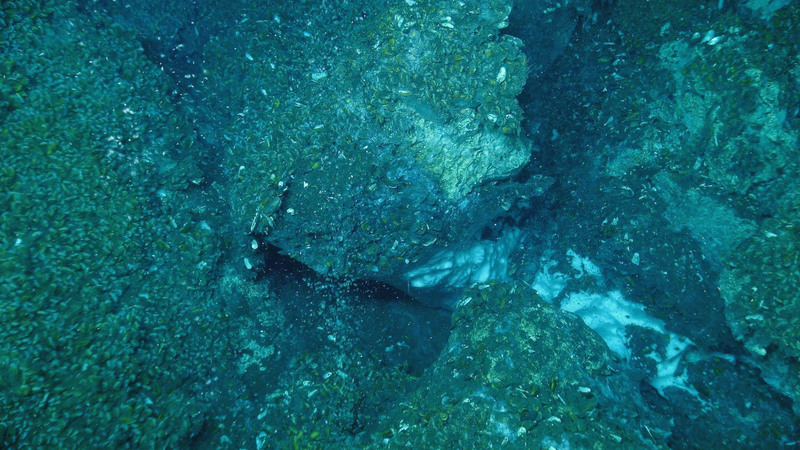 Seep mussels are found at depths up to 4000m (2.5 miles) below the surface of the ocean. They can also be really huge. Most of the live mussels and dead shells we collected from the seep were roughly 8-10 cm, which is in the size range of intertidal mussels. However, we also got a couple of shells that were real whoppers, measuring 16 cm and 28 cm (11 in). The most stunning difference between shallow water and seep mussels, though, is how they get their sustenance. Intertidal mussels are filter feeders and get their food, bacterioplankton and phytoplankton, from the water column. Seep mussels have the capacity to capture food from the water column as well, but they house chemosynthetic bacteria in bacteriocytes within their gills that turn methane bubbling up from the sea floor into a carbon source that the mussels can use for a food source. Most of us land-based life forms rely on plants to capture energy from the sun and turn it into carbon that the rest of us use indirectly up the food chain. Not so with seep organisms. We’ve yet to find Bathymodiolus individuals on open seafloor away from hydrocarbon seeps or hydrothermal vents so the chemosynthetic part of their diet must be very important. However, being able to do both makes them a unique and versatile organism in a patchy, often unforgiving environment. As far as I know, there haven’t been direct observations of any predation on live seep mussels. However, there have been lab experiments introducing dead mussels to various top predators found at these sites that showed the predators, especially crabs, will eat them. Gut content analyses of predators caught near seep sites also indicate mussel predation. 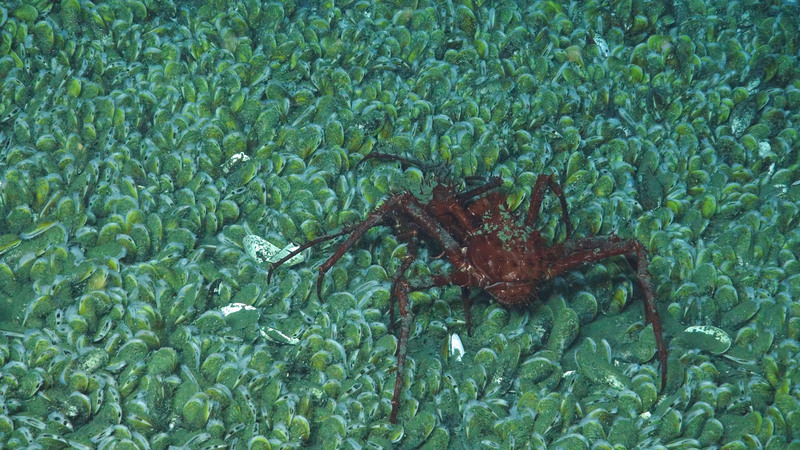 In our two dives at this newest site, we witnessed large spider crabs, different species of fish, and octopi that are all top predators lurking in the vast mussel bed. However, it could be argued that the predators are actually scavengers and only eat the mussels after they die. Someone would have to get video of a live mussel being consumed in order to confirm predation. I’m fairly certain that eating these mussels would be gross. Because they live on top of an active methane seep and are full to the gills (literally) with chemosynthetic bacteria that run on methane, this disqualifies them as being palatable. They might even be toxic. They certainly can be stinky when we dissect them. Not to mention the immense resources it would take to harvest them because they live so deep and trawling for them would render them broken and unmarketable. I think it’s a better bet for humans to figure out how to eat plastic before we turn to seep mussels as a food source. Methane can absolutely be used as an energy source. It’s the main component of natural gas. One of the funders of this project is the Bureau of Ocean Energy Management (BOEM) and they seek “to appropriately balance economic development, energy independence, and environmental protection through oil and gas leases, renewable energy development and environmental reviews and studies.” So part of their mission is to seek out new reserves of oil and gas in US waters, manage them, and be responsible environmental stewards in doing so. The difficulty with methane is its volatility and the fact that it’s a gas under “normal” conditions (we were able to find this site by following a trail of methane bubbles) makes it difficult to transport. Maybe we can learn from the chemosynthetic bacteria that so efficiently transfer methane into energy. This discovery is just more than exciting and your explanation is so well written so that the layman can understand. Now, how about just adding a bit of butter and garlic, lighting the methane in the mussel and letting it cook itself??? Couldn’t resist and said in jest, of course! The live broadcast to the museum is fantastic! Where are CNN, ABC, NBC and FOX…this needs national coverage!!! Katharine says “I’ll eat one if you will!’ Thanks for your comments and questions. We are enjoying the discoveries out here and are glad that the weather is continuing to cooperate! All I could think about was the line from “Finding Nemo” …..”Bubbles, bubbles, bubbles!! !” What a wonderful discovery! Nemo has had several references out here – particularly the personality of the crabs!